Soft and chewy Gingerbread Cookies are my favorite Christmas treat to decorate with my kids. They’re just as delicious to eat as they are cute to look at! For more delicious gingerbread recipes be sure to try Gingerbread Sugar Cookie Bars, Warm Gingerbread Cake with Caramel Sauce, or these Gingerbread Brownies! Hey everyone, this is Lauren visiting from Tastes Better from Scratch, and I hope you’re as excited to kick the holiday season into full gear, as I am! I couldn’t think of a better recipe to share with you to start the Christmas season than with these fun and tasty gingerbread men cookies! I love this recipe because the cookies are soft and chewy, instead of crispy, which I’m not a big fan of. Last year we enjoyed them for a treat, and then we let the leftover cookies dry out and we hung them on our Christmas tree. My kids loved it! Your kids will love to decorate them with you. We used regular buttercream frosting and added spice drops and m&m’s for the buttons. You could also use chocolate chips, red hots, raisins, or whatever you like. Mix the flour, brown sugar, baking soda, cinnamon, ginger, cloves, and salt in a large mixing bowl. Add the pieces of butter and incorporate them with a pastry blender until the mixture resembles fine crumbs. Mix in the molasses and milk and refrigerate or freeze your dough. 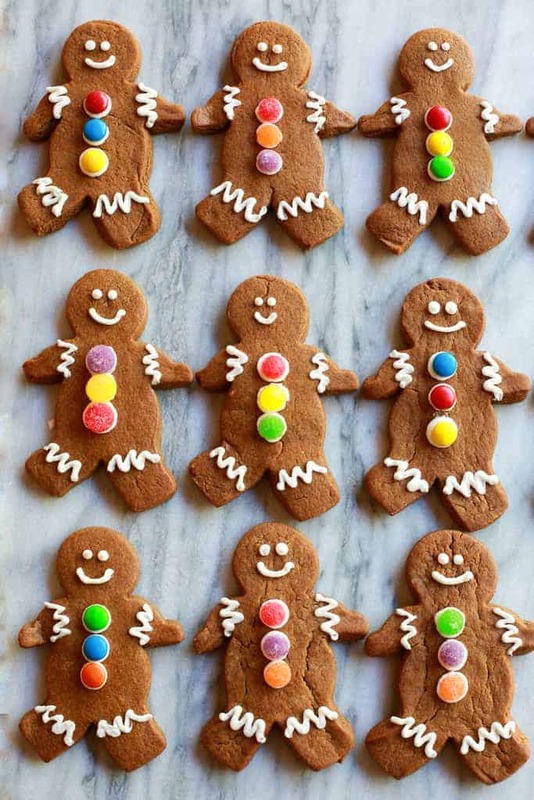 When ready to bake, roll out the dough to 1/2 inch thickness, use cookie cutters to cut gingerbread men or other shapes, and place them on your cookie sheet. Bake them for about 10 minutes at 350 degrees. Baking time for gingerbread cookies can vary depending on how big of a cookie cutter you use. You want the centers of the cookie to set, but keep in mind that they will continue to harden as they cool. Frosting and candy for decorating, if desired. Add flour, brown sugar, baking soda, cinnamon, ginger, cloves and salt to a mixing bowl and mix. Add the butter pieces and use a pastry blender to cut the butter in until the mixture resembles fine meal. With a mixer running on low speed gradually add the molasses and milk and mix until combined, about 30 seconds. Divide the dough in half, forming each into a ball. Wrap each in plastic wrap and refrigerate for 2 hours or overnight, or place in the freezer for about 20 minutes, until firm, if you’re in a hurry. Remove one dough sheet from the fridge/freezer and place on the counter. Roll out the dough (use a little flour on your rolling pin if needed), until it’s about ½ inch thick. 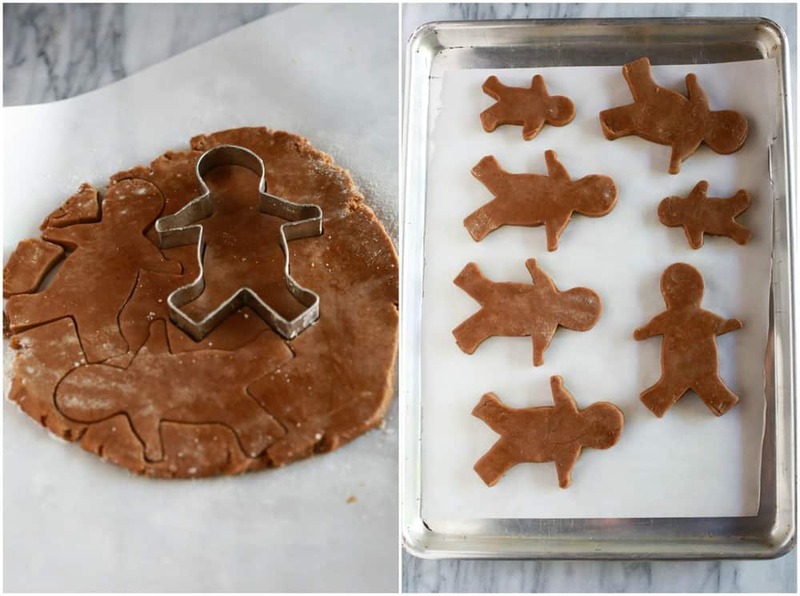 Cut gingerbread men and place them on prepared baking sheets. Refrigerate the gingerbread men for 5 minutes (meanwhile you can roll out the other dough ball). Bake the cookies until set in the centers and the dough barely retains and imprint when touched very gently with fingertip, 8 to 11 minutes (depending on the size of your cookie cutter). Do not overbake! Transfer the cookies to a wire rack and allow to cool to room temperature before frosting. Store gingerbread cookies in an airtight container with parchment paper between the layers. Freeze for up to 3 months. I was hoping this would also include the recipe for the frosting used in the photo. This looks like a fun activity for kids. Made these today and they were absolutely perfect!! Delicious!! Sorry, meant to post 5 stars!! So yummy! !